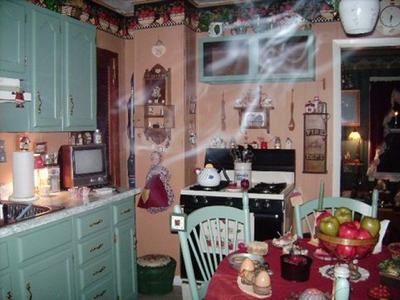 I took this pic several years ago after remodeling my kitchen. I did all the work myself. I took continuous pics and this is the only one with a Spirit. All the other pics were clear of any thing. I might add that my house is almost 100 yrs old. It's a small bungalow in the Mid-West. Comments for Kitchen Spirit ? This is a great shot. Very lucky, indeed. Pretty awesome! OUT OF ALL THESE PICS I RATE YOUR THE HIGHEST BECAUSE WHEN I SEE THIS I KNOW THERE IS NO DENYING WHAT IT IS! BECAUSE I'VE SEEN THIS STUFF MANY TIMES IN THE PICS I TOOK WHEN I LIVED 12 YRS IN A HAUNTED APARTMENT, WHY LIVE THERE THAT LONG YOU ASK??? WELL, MY HUSBAND NEVER WAS AWARE OF IT, LIKE IT ONLY LET ME KNOW, AND WHEN IT FINALLY DID MAKE ITSELF KNOWN TO HIM HE WOULD ADMIT TO IT THEN DO AS I DID IN THE BEGINNING, SHUCK IT OFF FOR IMAGINATION TILL THE NEXT INSTANCE PRESENTED ITSELF, WHICH CAN GO ON FOR QUITE SOME TIME, BELIEVE ME! YOU JUST CAN'T BELIEVE IT IS "FOR REAL!" SO YOU KEEP TELLING YOURSELF THERE'S A LOGICAL EXPLANATION TILL IT GETS WHERE YOU REALLY TRULY "REALIZE" IT IS REAL! BUT YEAH...SEEN THAT BEFORE! YOU GOT SOMETHING" THERE! CALL A PRIEST AND HAVE HIM BLESS YOUR HOUSE, THEY WILL DO IT FOR FREE, BUT PREFERABLY A DONATION TO THE CHURCH IS THE THING TO DO. I GAVE THE PRIEST $30 AND IT WAS WORTH IT!